Tangy and sour, lemon adds flavor to every cuisine. 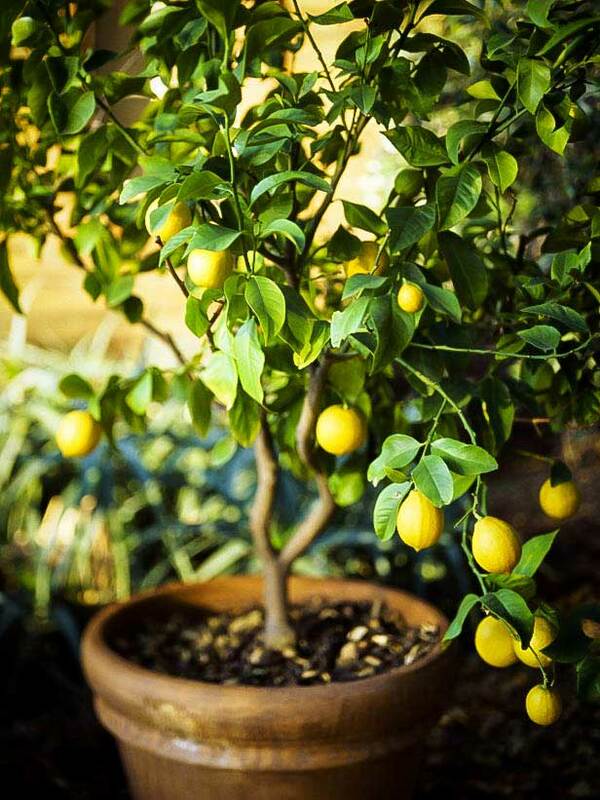 Learn how to grow a lemon tree in a pot. Growing lemon tree is easy if you follow the requirements given below. You want to grow lemons but stop because you run out of space or you don’t grow it because you live in a colder region. If this is your plight then growing a lemon tree in a pot is a smart idea. Plant it on a patio, terrace or in indoors, and you will be bestowed by its scented flowers and soft yellow citrus fruits. You can grow it in balcony too, Meyer lemon variety is perfect for kitchen and balcony gardens, especially for non-tropical zones. Growing lemon tree from seed is a bad idea because it can take up to 4 years to produce fruits. Instead, ask in local nurseries for dwarf varieties that can do well in containers. Varieties that are most suitable for containers are Improved Meyer, Lisbon Lemon, and Dwarf Eureka. However, a lemon tree doesn’t grow too big, which means you can grow almost any variety in the pot. *Buy a healthy lemon plant that is at least 3 years old, so that you don’t have to wait for it to start blooming and fruiting. Choose a pot that is 25% bigger than the root ball of the plant. 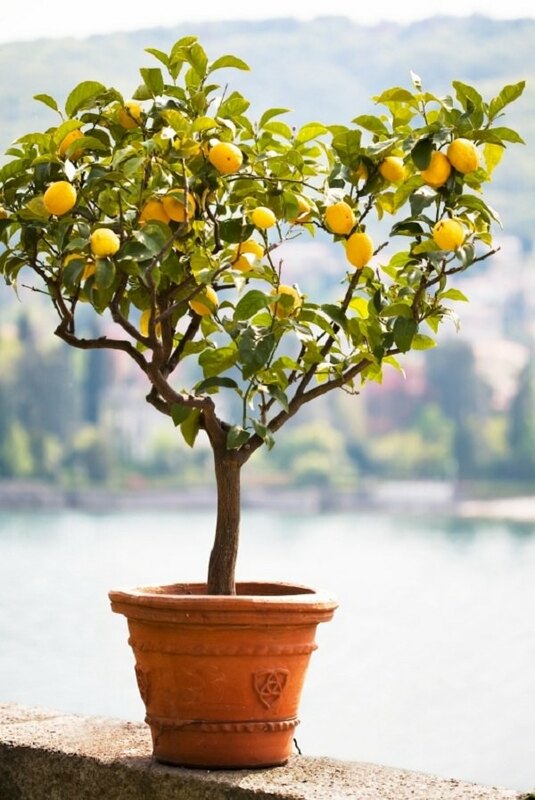 A clay pot is ideal because unlike plastic it is porous and evaporates water from sides, this helps the lemon tree to grow well as it dislikes being waterlogged. The quality and type of potting soil is an essential factor as well. For growing high yielding plants, use well draining organic potting mix. *If you’re growing a lemon tree in a balcony or any other small space, take care of its spikes, keep the plant in a corner. Repot your lemon tree in every couple of years or so at the beginning of spring (in warm climates, winter is the best season). Your pot size should be according to the scale of your tree. Avoid too large or small planters, keep in mind to use a container that is one size bigger than your previously used pot. *pH level of soil should be around 5.5 to 7 as this plant prefers slightly acidic soil to neutral soil. All plants in the citrus family love full sun, around 7 to 8 hours of sunlight is essential. If growing lemon tree indoors, use grow lights to provide adequate lighting inside. The lemon tree requires consistent watering to produce healthy fruits. Giving it too much or too little water can lead to blossom and fruit drop and sometimes plant may die too. Check top 2-inch layer of soil for dryness before watering. On windy and hot days, it requires more frequent watering and slightly moist soil. If you are growing a lemon tree indoors, it requires a certain humidity level to thrive, 50% is ideal. You can maintain humidity by placing it on a pebble tray or using a humidifier. If you’re growing a lemon tree in a pot in USDA Zones 8b to 11, you don’t need to care for cold that much, but below these zones, special care is needed in harsh winters. Temperature below 30°F (-1 C) is life-threatening for the lemon tree, except ‘Meyer’ lemon variety that can tolerate some cold till 24°F (-4 C). Freezing temperatures succumb these plants to death. Optimum temperature is around 50°F to 82°F (10°C to 28°C). To overwinter it, keep your potted plant indoors or in a greenhouse when the temperature falls below 35°F (2°C). Pinching encourages bushier growth, pinch growing tip when a branch is about 5 inches long. Pruning of lemon tree is best carried out when new growth starts (February – March). Be careful before pruning it, only prune diseased or dead branches because lemon stores excess food in its leaves and too much pruning can result in poor fruit crop. Also, keep looking for suckers and prune them immediately if found one. All plants of citrus family are heavy feeders, and lemon tree too requires fertilizer to produce juicy fruits, lush foliage, and fragrant blooms. Use special purpose citrus fertilizers for every citrus species plant, if unavailable use slow release fertilizer of NPK 12-6-6. Look for a fertilizer that contains micronutrients, especially iron, manganese, and zinc. To give boost feed to your lemon tree apply a water-soluble fertilizer once in a month in growing season. Occasionally, side dress your plant with compost or well-rotted manure. Pests like mealy bugs, spider mites, aphids, and scales occasionally attract toward it. To get rid of them organically read this article. Harvesting time depends on the type of variety you are growing and your weather conditions. The citrus fruits stop ripening once they are off the tree. To determine if the fruit is ripened, see if the fruit is heavy, soft and yellow. Keep your lemon tree in a less windy spot as it dislikes strong winds. If moving indoors for winter or outside for summer, acclimatize it to avoid shock. You can also do grafting to get two or more varieties from the single tree. I started mine from the seeds of a lemon last year. It took about 3 months before they ever popped up out of the soil…I had given up on it. its still in the same pot that I put the seeds in, and seems to be doing well – growing good. Oh well if it takes 4 years or more to grow lemons – its been fun watching it grow. It can take up to 4 years to produce fruits, but you can do grafting for quick results. How do you do the grafting? I planted lemon from the seeds , I have 2 that grew from it, they’re still small but doing good. it’s been 2 years, and my goodness I have to wait for 2-3 more years for the lemon to come. same here but iy grows fast. in two years it grew4 feet tall,I just started pruning it. I’m debating if I should transplant it in a smaller clay pot as it is in a huge outdoor resin pot where I have a collection of other plants I grow in there? I started mine from seeds also. It is doing good. I enjoy seeing the growth. That’s great to know. We’ll look forward for pictures, share them with us on social networks. I have had my Meyers Lemon tree for years and it usually produces 6 to 7. This last time around it was infected by these little critters that looked like tiny marshmallow so it didn’t do as well. Look forward to trying out all the information so that possibly my tree will sprout even more lemons. I got a Meyer last spring. It was supported by a stick but the trunk of the tree hasn’t got thicker or stronger. What should I do? Remove the stick. Trees grow thicker in response to stress; no stress, no strength. Be careful how much fruit you let it produce until it thickens up. Remember one thing in the winter plants do not need much watering. Let the soil get real dry and than put enough water to soak up the soil. Another thing keep it away from heaters, they need natural temperature so expose them to sun light as much as possible as they love the sun. Do not fertilize your plant in the winter. Wait 3 months and when spring comes, than use slow release fertilizer. Good luck!! When do I pull off fruit? Should I wait until spring to change to bigger? What’s the best way to provide light indoors. I have it in a pot..the tree reached around 2ft.. I cracked opened the base of the pot and plant them outdoor.. It has been a year outside, the growth seems very slow and the leaves yellowish and spotted, looks un healthy.. Is there something wrong? Wish smbody cld help.. I appreciate it..
Yellowing leaves is either lack of soil nutrients and/or they need water in a consistent matter. Water only until moist the same day(s) every week. Hope this helps! I must add to the post from Steph, yellowing leaves can also be from too much watering. I nearly lost my lemon tree last year. When I saw the yellow leaves I thought it needed more water, so not true. I watered it more and lost even more leaves. Then I moved it outside this summer as I always do and forgot about it. The mist from the sprinklers was great, I didn’t water it at first, let it completely dry out. Then only watered about once every two weeks and not too much at a time. Drying out and only the mist from the sprinkler was the saving grace for my Meyer lemon tree. It’s now producing fruit again, although I did lose about 7 started fruits when I stressed it out. I’ve learned my lesson. Good luck! I tossed a couple of lemon seeds in a pot around a month ago and now I have 10 tiny plants (2 inches high). When should I repot them separately? I live in India and the climate is quite hot. 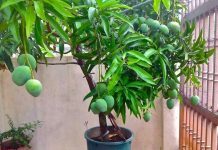 Hi Abhinaya, Our sincere advice for you and all our readers– Always avoid growing fruit trees from grocery store seeds or seeds you get from fruit pulps because they may not come true and may produce bad and lesser quality fruits, the future plant will not remain healthy too. The best option is to buy a grafted lemon tree from a local nursery or online. You should avoid repotting plants in hot and scorching Indian summers as they may die if it is too hot. But if they are extremely root bound to pass the summer, try to repot them on a cool, cloudy day and place them indoors in indirect light after repotting. Also, mist them a few times a day to keep them cool. I have a lemon grown from seed I have had for over 15 years. It has never bloomed. I give it plenty of sun in summer, I have pruned it to shape, looked terrific but no blooms. It is in a 5 gallon pot, and must be 6′ tall plus. I wintered it in my home in Ohio zone 5 in a kitchen corner where there is light on 2 sides. Very bright and cool. I keep it watered , our home is somewhat dry, so this year I am wintering it in a greenhouse. Any suggestions besides it is time to fertilize it again? Years back, the Pro’s advice was to fertilize potted Citrus from Spring thru early Fall (Bay Area, California) once a month at half strength. He may have been referring to liquid fertilizer, that you were meant to make a solution diluted by twice the water, and because it was weaker it was used more often. This was an Old-Timer who was “Old” 30 years ago (!) so he more than likely was referring to Miracle Gro or similar. 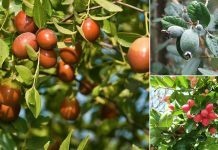 In those days they were looking for immediate results, not necessarily focusing on fruits, but Commercial Nursery Beauty, where the healthy looking plant was what sold. The Old Timer was a very successful owner of a Garden Center chain, and I have to admit his advice did get results. Then the Organic Movement had to go ruin it all by educating us on how we could be hurting ourselves and our children with all the poisons we are taking into our systems because of what we fed our plants and what we sprayed on them that killed the baddies right along with the good guys. Anyway, they do have some organic ferts specifically for citrus, and you should probably research more but my gut tells me a healthy tree doesn’t want too much nitrogen (promotes green growth at possible expense of fruits). The idea of repotting with new organic bagged potting soil, mentioned above, sounds lie the best idea here so-far. My poor little Meyer is putting out several fruits in spite of how I treat her, and I haven’t fertilized her in at least 4 yrs, the length of time in the pot. Linda, I was planting them like crazy straight from a lemon. I have beautiful plants but saw a video on YouTube and realized from the guy that it won’t actually produce fruit. You have to peel the shell from the actual seed inside. I’m trying that now. I’m in the process of growing roots right now, then I will plant them. Though BGW says you can’t do this, the guy on YouTube has had success and is actually growing fruit! However, I’m not sure how long it has taken him but it didn’t sound very long. I’m anxious to try. I have 3 lemon trees that I started from store brought lemons and peeled out the seed from shell, wrapped in moist paper towel and put it inside plastic baggies in cool dry place till sprouted, I believe it took 3 yrs for my plant to produce fruit. Have reported once with new soil, use organic spray to kill those white mites, bring it indoors winder and leave always fall off but returns once taken back out doors. Will fertilizer more this yr to see if get a higher yield of fruit. I did buy one myer lemon and left it outdoors this past winter, covered pot with 4″ mulch and cloth during nights. Looks healthy still. I have fed, watered and repotted and my lemon tree is still yellow. What am I doing wrong? Your lemon tree must be too wet! Invest in a moisture/light meter which you insert deep in the pot. Water your lemon only if the meter shows dry on the display. 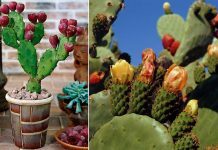 Excellent articles on how to grow plants . Hi I have a lemon tree for8 years it only had lemons one time … I was hoping this year to Bloom so I can see same lemons .. But not again ? Is three years now and nothing . If you don’t mine can you help me with this ? Thank you . ? I bought citrus fertilizer spikes from Wal-Mart for my lemon tree last spring and ended up with twice as many fruits! You might want to give these a try – they are the Jobe’s brand. They are just pushed down into the soil around the plant. Mine is grown in a large pot but if yours is in the ground they recommend using a hammer to drive in the spikes. These worked well for me. I got a very small grafted treeMeyer lemon tree. It may have had 3 short thin roots. At 8″ tall I pinched top leaves.It took a while but it did split into two branches.Ive been adding mycorizza weekly as seller told me to do from end of may2017 until almost end of Sept.I haven’t checked but it’s rained for 24 hrs. & still cloudy so I may check them today. Wish me luck.ive had a lot of suckers today I’ll know if mycorizza grew any roots. It must have grown some since it kept growing after pinching leaves at about 8″ tall. Wish me luck & I’ll be praying for all you seed growers. Comment:hiii….i put sime lemon seeds last month in pot but still waiting to pop-up seeds…..anybody can tell how much time it will take to popup.. I have grown lemon trees from seeds. You must use organic lemons. I Have several right now on my window sill. They are a vibrant green and so healthy . I use one organic lemon and have six trees started. Very little water and lots of sunshine. How do i identify suckers? My lemon tree is still a stick,how do I get it to spread folage. Well mycorizza did grow full roots .by end of summer I checked my roots & they look great .Its under 1yr.dec.col brought it indoors & I have small fruit & more blooms .to keep fruit do I pinch off new blooms to keep 3tiny lemons? Any help would be appreciated? Thank you for this great post! I am going to do this, finally, this year! I started a meyer lemon by seed in a small 4 x 4 pot. Unfortunately it had a bit of a growth spurt and got very tall and leggy. I have since re-potted in a larger pot but I am wondering, if I plant the main stem down into the soil will it root outwards such as tomatoes do? I know the success of this varies on the type of plant, i.e. peppers will rot if the main stem is planted down and will not root out. I have the plant under a grow light in my basement on a heat mat and it has done very well. I hope to adjust it to natural light and eventually outdoors during the summertime once I think it’s ready :) The tree has branched out by itself about 12″ above the soil and is now budding. Thanks! Enjoyed your article. Think I will try it. I am looking to purchase Meyer Lemon plant for delivery in India. Can any one please tell me from where I can get it ? I purchased a lemon tree this spring, it did well and produced two lemons (its about 1.5 ft tall). Its started to drop leaves and is setting out a whole bunch of blooms. should I let it set fruit again ? pinch the blooms so it concentrates on leaf production? I am just worried it doesn’t have enough leaves to produce fruit. There seems to be lots of info on growing and caring for lemon trees but I can’t seem to find specific info on early care/strategies for pruning young, indoor lemon trees grown from seed. I have three indoor lemon trees that I have grown from seed that are around a meter tall. They are about three years old and no pruning or pinching has been done yet. I plan to keep them indoors (outdoors in the summer) and I am curious as to when to start manipulating height and shape. Should I be pinching back the central stem at some point/height? What should I do with the branches? Should I Be promoting bushier growth now? Or let the trees keep doing their thing for awhile longer? Thanks in advance for any help and advice! i started to plant lemon tree from seed and 5 half of the year has passed and now I’m soo happy seeing my baby growing healthy and it start to grow few branches. Our potted lemon tree had all its leaves blown off in major winter rains and has a few small fruits on bare branches.Is this tree dead or drowned? ?Should i wait and see if new leaves appear in spring? I threw a couple of lemon seeds from lemon that I brought with me to India from Naxos (Greece). The plants grew tall in no time. They are healthy but it’s been 4 years now and I have yet to see any flower or bud on it. I use water-soluble NPK fertilizer in all my pots every 2-3 months. Is there anything special that the plant needs to bloom? Same with my orange tree that grew from seed too. The Lemon trees can take up to another 2 years to sprout, and the oranges can take up to 6+ years before they will produce if they were not from a grafted tree and came from a seedling. Grafted trees will produce fruit faster because they have already completed the waiting period before producing fruit. And that’s why trees from your local nursery will grow fruit faster and rather quickly. When it comes to seedlings we will have to wait the gestation period our before we will be rewarded with fruit. You can try to speed up mother nature but when you do it is like grabbing the bull from the horns. You kind of just don’t do it, But rather just be patient. Anyways for those who wait will be blessed with bountiful fruits. Now it is a Waiting game. I have 7 lemon trees in pots on my window sill which I brought in from a small greenhouse two weeks ago as the autumn can bring frost in England early, they are all doing well about 6 inches tall and dark green leaves the eighth one is about 2 inches tall green plenty of leaves but so small although healthy why would this be ? they all came from one lemon which fell from the tree in front of me in Cyprus in May, I call them my living memories and have not a clue how to care for them but must be doing something right.